La empresa holandesa de predicción de viento AEOLIS (windknowhow.com), cliente de Transfer, recientemente estuvo en las noticias con un comentario sobre la espectacular producción eólica en España. Está claro que las inversiones en renovables durante los últimos años están pagando dividendos para los distribuidores de electricidad, aprovechando los fuertes vientos que actualmente soplan por el país. Resto del articulo en inglés. Wild weather across southern Europe this week is expected to produce a record amount of renewable electricity. As Spaniards were today warned to batten down windows in order to fend off fierce Atlantic gales, the country's electricity distributors were anticipating a windfall – a huge boost in power generation from the country's wind farms. Spain has built so many wind farms in recent years that the arrival of high winds and the subsequent surge of electricity into the national grid now has an immediate impact on the price at which it is sold. The country's meteorological office today put parts of the country, especially the north-west region of Galicia, on the second highest warning level for extreme winds. It predicted gusts of up to 120km per hour. Prices being paid for electricity on the spot market, meanwhile, are reported to have dropped by 11% as production looks set to increase relative to demand. Spanish energy companies are obliged to buy electricity produced from renewable sources before they turn to other sources such as coal, oil or nuclear plants. "When there is a lot of wind there is normally a drop in price," said a spokesman at Aeolis, a Dutch company that makes wind predictions for European countries. "Other producers will lower their prices if they see more input from wind because they don't want to shut down and cannot slow down their production so easily." The current record for overall electricity production from wind in Spain was set on January 22 this year. Generation then reached 11,159MW , accounting for 26% of early evening demand. The Bloomberg news agency last week calculated wind speeds in Spain were expected to reach 29% higher this week than they were on January 22. Any further increase in wind speed, however, may lead to a lowering in production as turbines are programmed to switch themselves off when gusts are high enough to damage them. 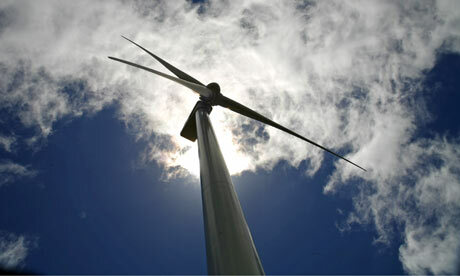 Spain added another 11% to its wind-power capacity last year. That increase contributed to a year in which wind power accounted for 43% of new generation capacity – more new electricity capacity in Europe than any other source. Spain finished the year with 16,740 MW of installed wind capacity, second only to the United States and Germany. The lower prices paid by Spanish electricity distributors when wind farms are operating at their best are not passed directly on to consumers – most of whom pay a fixed rate.